Thank you to Charles Day, who emailed the News Journal regarding last week’s Throwback Thursday photo. He noted that the photo was Clinton County Army Air Field (CCAAF) Hangar #1 (of 4) built during winter of 1942-43 for the USAAF Glider Test & Experiment unit. He said the CCAAF was closed in November 1945 to be readied for use as an all-weather flying sub-field for Lockbourne. “CCAFB came into being after the USAAF (USAAC) became the USAF in 1947,” he stated. “The #1 hangar was converted to a gymnasium by redecorating. 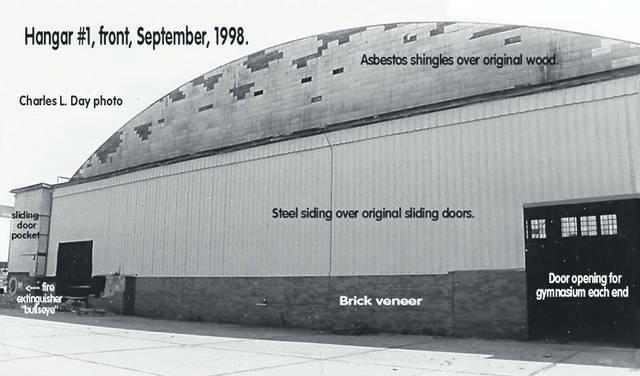 The exterior was covered with metal siding and brick.” This week’s photo is from 1998 when the hangar was being torn down, he said. Day added that, “If you were a Boy Scout or Girl Scout in Clinton County circa 1943-58, you likely slept in a CG-4A glider shipping crate.” Charles Day is National Secretary of the National World War II Glider Pilots Committee, a committee of the Silent Wings Museum Foundation with a mission “to perpetuate the memory of those men, their service to country, and to keep alive the information of the relatively unknown glider program of WWII.” Learn more at: www.ww2gp.org/index.php . Day is also author of “Silent Ones: WWII Invasion Glider Test & Experiment: Clinton County Army Air Field, Wilmington, Ohio” which is available at amazon.com.